The historic facade of Boutique Hotel Bristol is an exceptional sight of downtown. 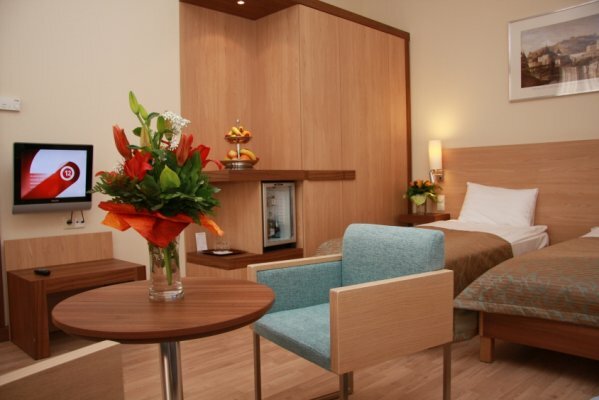 The hotel with its relaxing ambient and fine elegance has become a true pearl of downtown Budapest. 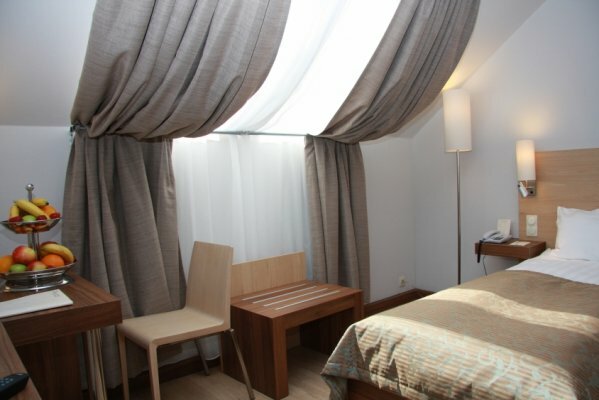 Boutique Hotel Bristol is an ideal place for business and tourists who enjoy the boutique style and for whom the high quality of hotel services and the nearness of the numerous entertainments and cultural activities offered by the attractive capital are important. Boutique Hotel Bristol is situated in downtown Budapest, in a central location of the business quarter of the capital, near the International Eastern Railway Station and The Central Avenue of Budapest (Rákóczi Street). 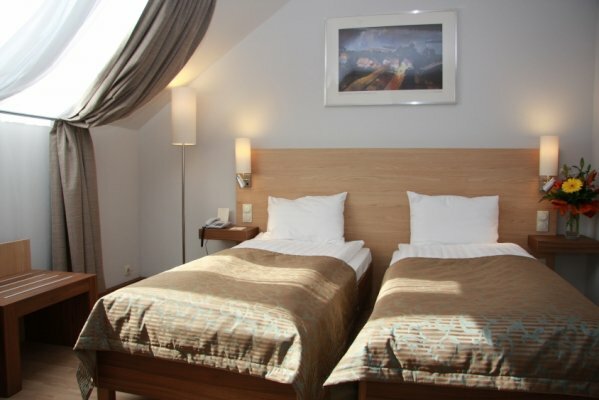 Boutique Hotel Bristol is very well located for sightseeing the best of Budapest. Boutique Hotel Bristol offers the most outstanding services for tourists and business travellers who love the boutique style. 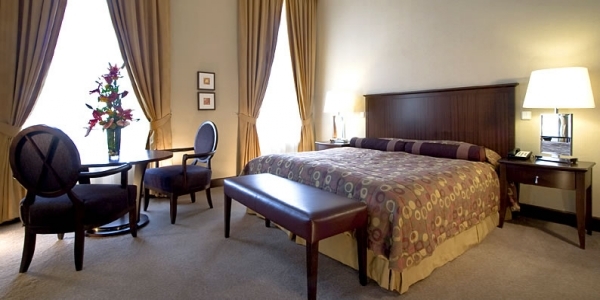 Our guests stay in comfortable, well-equipped and spacious rooms in a modern 4star stylish environment. The atmosphere of Boutique Hotel Bristol **** is ideal for meetings, trainings, company and family events. One specialty of Budapest is that it is the only large city in the world which is very rich in medicinal water springs. The total discharge of thermal water with temperatures ranging from 21° to 78°C, gushing out from 118 natural springs and drilled wells, is 70 million litres per day. It has been known as early as the Roman Age that the water of the thermal springs has curative effects. Having occupied the territories to the west from the Danube, the Romans established the town of Aquincum, for they liked the healing waters of the gushing, hot water springs. You can see the ruins of their enormous baths in several places in Óbuda. During the Turkish occupation of Hungary (1541-1686), a number of baths were established for the purposes of personal washing and curing. 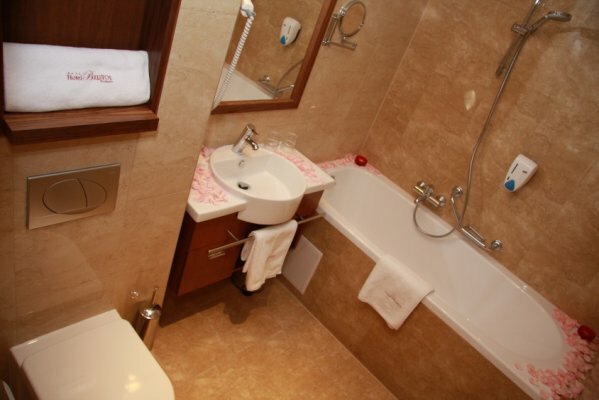 The relics of the Turkish Age have remained intact to date in a few baths. Budapest was awarded the rank of “City of Spas” in 1934. Bathing culture plays an important role in the life of Hungarians. In Budapest, medicinal baths, thermal spas, open-air swimming complexes and swimming pools can be found all over the city. The elderly like to spend their time in baths, since balneotherapy courses are very well suited for curing diseases and mitigating their symptoms. 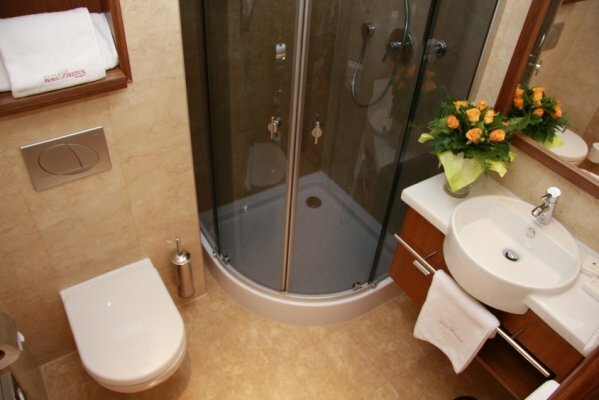 In addition, the beneficial effect of thermal water also helps in the maintenance of health and relaxation. Special bathing at night and Cinetrip (more recently: Magic Bath) parties are popular among young people in Budapest. Tourists visiting Budapest may gain a great experience if they visit and try one of the medicinal baths. We wish to remind you that before setting off to discover a public bath, seek information, because not all public baths may be used by both sexes at the same time or may only be visited jointly by men and women on selected days. It is worth trying one of the largest bathing complexes in Europe, Széchenyi Baths, or the most beautiful public bath in Budapest, Gellért Baths, as well as the beautifully refurbished Rudas Baths, which host nighttime bathing. Budapest has a distinguished place even among the most beautiful cities in the world. Visitors to Budapest can choose from a vast array of cultural and entertainment possibilities. As a big European city, it awaits the visitors, where aside from its many historic sights there are also natural and architectural sights which have been awarded the horouning title of “World Heritage Site”by UNESCO. You can spend several days sightseeing, since, in addition to the classic Castle Quarter, Parliament and Hősök tere (Heroes’ Square), you can have a special experience while strolling, for example, in Városliget (City Park), the Jewish Quarter, where the largest synagogue stands in Europe, or in Memento Park which preserves the memories of communism. Budapest also offers a colourful range of programs for those who like cultural entertainment. You can choose from a wide array of beautiful nights at the Opera House and theatrical, classical and light music performances. The Budapest Spring Festival offers the very best of Hungarian and international musical, dramatic, cinematic, and fine art year after year. Every summer, the city hosts the Island Festival, which is enjoyed both by Hungarian and foreign young people alike. Hungary is famous for its fine wines, thus a series of wine festivals await those interested every autumn. There are museums all over the city, you can choose from a large number of permanent and temporary exhibitions, and everyone can find one of their liking. For example, exhibitions of international fame can be seen in the Museum of Fine Arts (Monet, Van Gogh, Pharaohs, Renaissance painters, etc.) and from time to time, you may admire Hungarian painters’ pictures in the National Gallery. In addition, those who like the extraordinary may, for example, view the world famous Vasarely Museum or the Press Photo Exhibition organised every year. Visitors to Budapest can choose from a vast number of program possibilities during the nights spent in the Boutique Hotel Bristol. In addition to musical and theatrical performances, do not forget our best restaurants, where you can try international and Hungarian specialties. Those who arrive in Budapest should not miss the colourful and unique tastes of Hungarian cuisine. After a pleasant dinner, you may go for a night boat trip on the Danube or may indulge in nightlife. The city offers superb opportunities for those seeking entertainment. Youthful open-air and indoor places of entertainment, music pubs, night clubs and casinos await their guests. If you wish to participate in any program during your stay at the Boutique Hotel Bristol our Reception will be pleased to help you. In special cases, we may even organise your sightseeing with a private guide in advance or reserve a table for you in a high standard restaurant, but we may even book tickets for you to the Opera in advance, before you arrive at our hotel. Budapest is a real Paradise for hobby shoppers, whether it is clothing, accessories, antique works of art or those listed by galleries, food or anything else. Wherever you go in Central Budapest, shops and boutiques await you. The best known pedestrian street of Budapest, Váci utca, has been shining in its old splendour for years, and the construction of Fashion Street which offers the world’s fashion brands has been completed now in its vicinity, in Deák Ferenc utca, on the model of Regent Street in London. 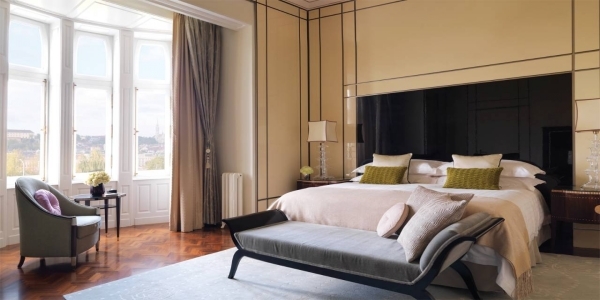 We recommend Andrássy út, which is also located in Central Budapest, for those who have a desire for luxuries. Shopping centres, which form an essential part of large urban metropolises today, can be found all over Budapest, in which visiting shoppers can buy everything at one place. Offering a gigantic selection of goods, Arena Plaza, the shopping centre with the largest floor area in Hungary and, at the same time, Central Europe, which houses 200 shops and nearly 30 restaurants, cafés and confectioneries, is located near Boutique Hotel Bristol . Covered markets and the Ecseri út second-hand market represent real experiences of Budapest. You can also buy folk art products on the upper floor of Nagyvásárcsarnok (Central Market Hall). It is worth paying a visit to an antiquity street in Central Budapest, Falk Miksa utca, which has developed since 1990 and offers its goods in a concentrated form similar to that of Paris and Rome. If you shop for the purpose of buying gifts, we kindly remind you of the special products of Hungary, the Hungaricums, which are foods, goods and works of fine art of excellent quality. The Pick Salami of Szeged, the Old Tokaj Wine, the Zwack Unicum bitter liqueur and Porcelain of Herend are world famous. You can also choose from a colourful offering of products of folk art, such as the Lace of Halas, Miska jugs, embroidered clothing, table cloths and wooden objects. While you are staying at the Boutique Hotel Bristol Budapest, aside from the salami and the old Tokaj wine, do not forget to try meals made from red peppers or the meat of healthy Hungarian hog, mangalica, or of the grey cattle, the famous goose liver, the fine Dobos torta (a layered chocolate cake with a hard caramel top) nor the wines of the Villány Hills. All of these are available downtown, in an easily accessible place, beside Budapest’s central boulevard, Rákóczi Boulevard. An other advantage of the hotel is that in spite of the central location parking is easy in the neighbouring parking house. 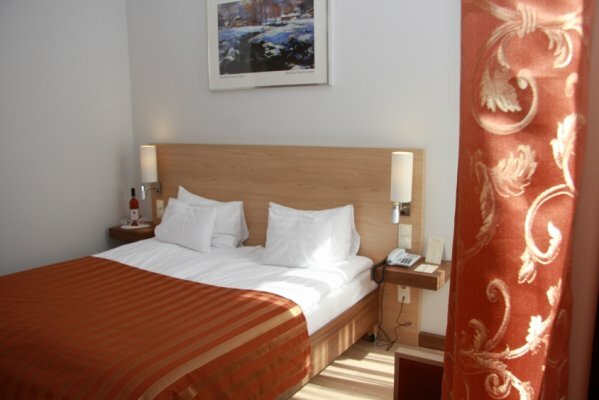 Choose Boutique Hotel Bristol as the venue for events in Budapest and we guarantee the quality. All three events rooms in Boutique Hotel Bristol offer unique ambient and are eminently suited for holding small company events in downtown Budapest. This modern 37 m2 room on the ground floor of Boutique Hotel Bristol is an ideal venue for business breakfasts, small conferences, pow-wows and company trainings and meetings. The striking features of the room are the giant windows and peaceful ambient. This room is located on the sub-ground floor of Boutique Hotel Bristol. This 33 m2 room with natural light is the ideal venue for section meetings, company pow-wows, meetings. Due to its ambient the room is also well suited for holding wine tasting. The room, due to its location is also an excellent venue for the practice of music groups. The atrium centred Bristol Garden with its unique atmosphere is the perfect venue for elegant, small company lunches or dinners. It can also serve as a special venue for homely, elegant weddings. The classic internal design and modern style furnishing combine to create a special atmosphere. Our buffet table or menu selection served at the tables by well trained and guest loving staff will make your company or family event unforgettable. The atmosphere will be enhanced by the place bathed in the light of Swarovski crystals and the soft background music. Modern technical equipment ensure the comfort of our guests: screen, LCD projector with remote control, sound reinforcement system, flipchart, overhead projector, WIFI Internet, CD/DVD player, TV, laptop, microport, laser pointer. Are you tired of the stereotyped weddings? Do you want to dazzle your relatives and friends with a special and elegant venue? We recommend the atrium centred Bristol Garden with its unique atmosphere as the place to hold your wedding; this is the perfect venue for an elegant, small wedding lunch or dinner. The classic internal design and modern style furnishing combine to create a special atmosphere. Our buffet table or menu selection served at the tables by well trained and guest loving staff will make your wedding an unforgettable event. The atmosphere will be enhanced by the place bathed in the light of Swarovski crystals and the soft background music . 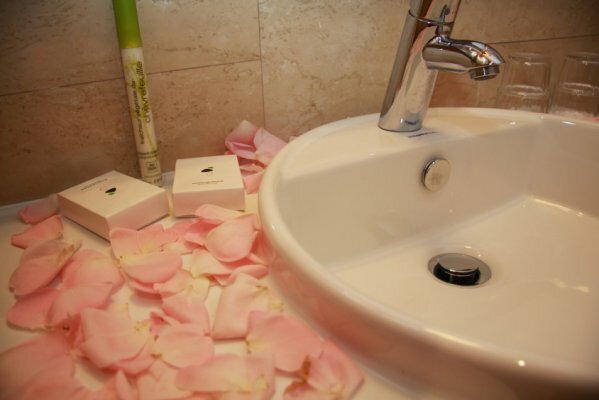 The hotel offers a double bed bedroom for your wedding night as a wedding gift. The rent of the place where the ceremony is held is also a gift from the hotel! We help you organise the civil wedding ceremony at the site! We offer 3, 4, or even 5 courses menu, or buffet. A package of drinks/beverages is provided for the duration of the wedding feast and unlimited consumption is ensured! 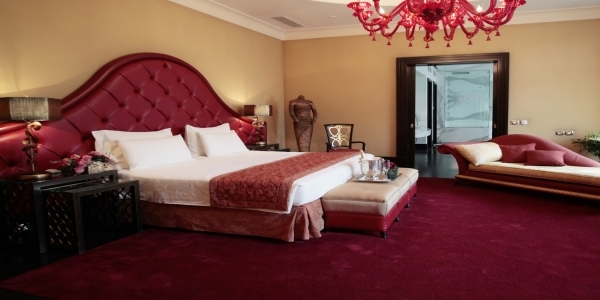 The hotel awaits its guests with a total of 49 designer rooms. There are different room categories to satisfy the demands of all business and pleasure guests who wish to spend their holiday with us. 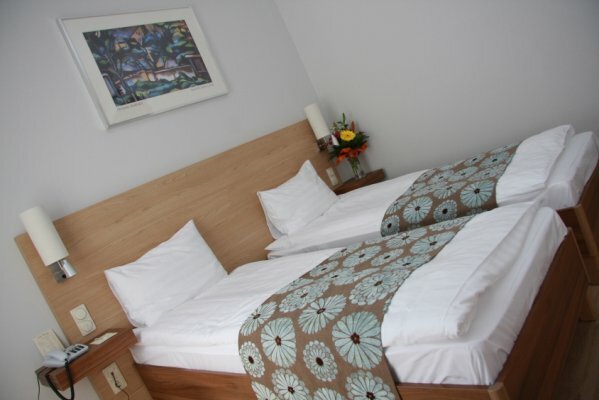 There are 18 double bed and 31 twin bed bedrooms. 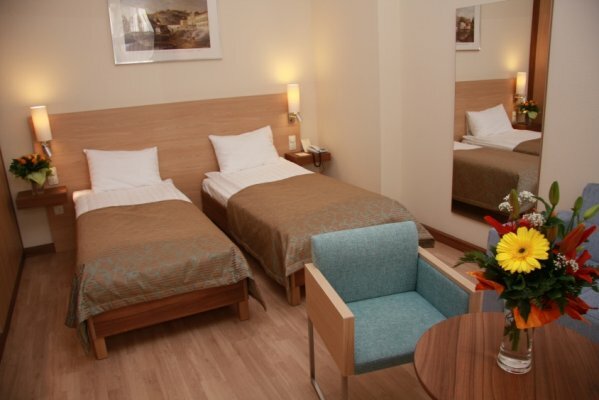 Among our standard category rooms there are 2 intercommunicating family rooms which provide comfortable accommodation for families. 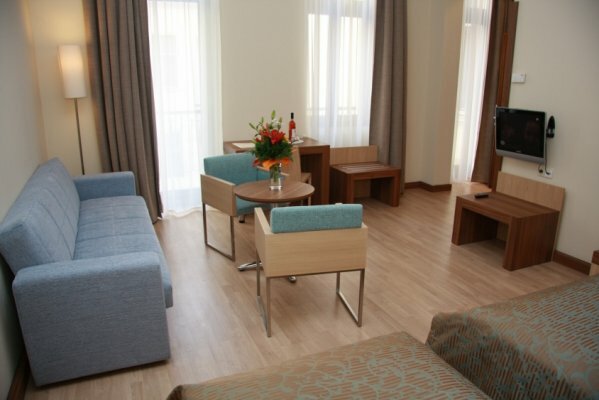 Both for our smoking and non smoking guests, we have rooms arranged for their convenience. An abundant buffet breakfast awaits our guests in Boutique Hotel Bristol every weekday between 07.00 and 10.30 a.m., and every weekend between 07.30 and 11.00 a.m., offering a choice of Hungarian and international dishes, served at the custom designed, glass-roofed Bristol Garden breakfast lounge, where everyone can find their favourite morning delicacies. Besides our delicious breakfast varieties we also offer a selection of cold and hot morning drinks. 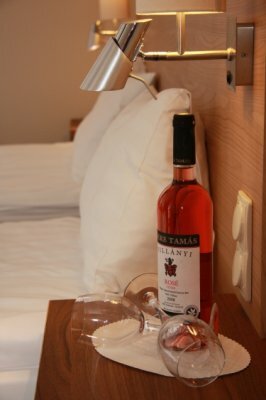 Hot drinks and croissants are offered for the early wake up guests from 04.30. a.m. The room prices always include an abundant buffet breakfast. The classic internal design and modern style furnishing combine to create a special atmosphere in the lobby of the 4 stars Budapest Boutique Hotel Bristol, where the drinkbar is open all day long. Everybody can choose his/her preferred drink from the colourful selection of the bar bathed in the light of the Swarovski chandelier. The broad selection offers soft drinks, alcoholic and non alcoholic beverages. 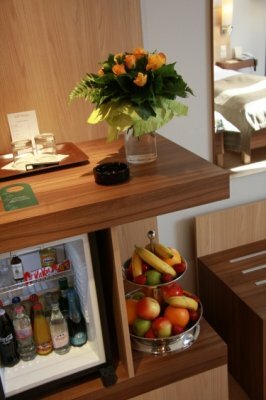 Our guests can also find sandwiches, snacks, fine teas and coffee specialities in the offer of the bar.